Contributed Photo/Courtesy Chris Taylor: A hot air balloon rises over the first POWWOW of the season. 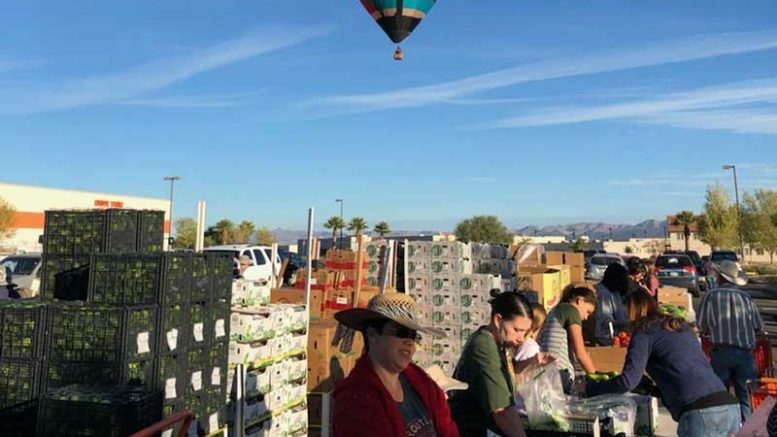 SAFFORD – With several new faces added to the nutritional morning of service and visiting, the first Produce on Wheels Without Waste (P.O.W.W.O.W) of the season blasted off at the Home Depot Parking Lot on Saturday. The Borderlands Food Bank has teamed up with the Safford Lions Club this season, bringing more volunteers to the mix. Gila Valley Central visited the first POWWOW of the season on Saturday to see what attendees could expect this season. For those who may have missed it, there’s no reason to worry; the next POWWOW will be Saturday, Dec. 9, starting at 8 a.m.
Brooke Curley Photo/Gila Valley Central: From left, Karina Vega, Kristiana Alva, and Julian Martinez help sort and count produce for the POWWOW. One of the biggest changes is the Safford Lions Club partnering with the Borderlands Food Bank. Gila Valley Central caught up with Safford Councilman Chris Taylor, who is this season’s Co-Chairman for the POWWOW. Taylor told Gila Valley Central that the Safford Lions Club partnered with Borderlands with the mission in mind to help diminish disease in the Gila Valley by aiding in the distribution of healthy foods. Brooke Curley Photo/Gila Valley Central: Produce is left on tables for individuals to choose their allotment of 60 pounds. Among the volunteers that showed up on the sunny Saturday morning, school counselor Shiloh Wheeler brought a gang of 10 Thatcher High School students. Despite the early hour, the Thatcher teens were cheerful and went about the job of sorting out the produce with smiles on their faces. Thatcher Mayor Bob Rivera attended the POWWOW and was one of the volunteers handing out produce to families of the Gila Valley. Rivera told Gila Valley Central that he was especially grateful to the high school students who volunteered. Also, Rivera invited everyone to the next POWWOW. As always, the POWWOW offers individuals registered into the program 60 pounds of produce for a $10 contribution. The POWWOW is an element of the Borderlines Food Bank, which is a non-profit organization located in Nogales, Ariz. The organization rescues nutritious produce and ships it to families. By rescuing, the organization, in fact, takes the overabundance of produce that grocery stores don’t have enough room for. Borderlands has been in operation for 20 years and has annually shipped between 30 to 40 million pounds of produce in 39 different varieties. Borderline Food Bank delivers the produce throughout Arizona, including the Tucson and Phoenix areas. If anyone is interested in volunteering at the POWWOW, you can simply show up early to the event and ask for direction from those in charge. Dec. 9 – 8 a.m.
Jan. 6 – 8 a.m.
Feb. 3 – 8 a.m.
March 3 – 8 a.m.
April 7 – 7 a.m.
May 5 – 7 a.m.
Each POWWOW will be located at the Home Depot parking lot in Safford. Brooke Curley Photo/Gila Valley Central: Watermelons are some of the prized items of the POWWOW.